Defending world indoor singles champion Nicky Brett survived a major scare against 71 year-old Scottish qualifier Charles Bence in the second round in Norfolk today (January 25). The Yaxley ace needed to come through a nail-biting final end of a winner-takes-all tie-break before finally shaking off the determined septuagenarian for a 5-7, 10-4, 2-1 victory, to progress to a mouth-watering quarter-final clash with 2013 winner Stewart Anderson in the Just 2017 World Professional Indoor Bowls Championships at Potters. Brett paid tribute to his vanquished opponent, who laughed and joked throughout, with his infectious jollity rubbing off on the champion. He said: “Charlie was fantastic, he was great on the rink – I even learned some new words, gurling, whatever that is? It was unbelievable. He was killing me every end, even on the rink. “He played fantastic. I played some good bowls early on and he was killing me. I was 3-0 down in both sets and wondering what I had to do. There was a lot of pressure on me, trying to find a couple of good ones. Every time I found one, he beat it. 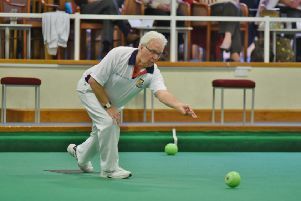 The sport of bowls has been trying for years to shake off its wholly undeserved image of ‘old man’s marbles’, but Motherwell-based pensioner Bence was determined to prove that the older guy still does have a role to play in the higher echelons of the sport as he took the game to Brett from the off. Three ends in, Brett found himself 3-0 down, as his opponent rose to the challenge of facing the man who lifted the coveted trophy 12 months ago and if Bence was feeling overawed at the prospect of playing in front of a large crowd, live on BBC2, he certainly wasn’t showing it. He had previously upset 16th seed Mark Dawes in the first round, on his first-ever appearance in the tournament, but after Brett scored a three on end four to level the match and then move 5-3 ahead, one sensed that the 42-year-old would power further clear and put his jocular opponent in his place. Bence was not going down without a fight, though, and fought back to level before pinching two singles to claim the first set and give Brett a real headache. Going 3-0 down early again in set two put Brett, who despite his troubles seemed to be having just as much fun as Bence out on the portable rink, massively on the back foot. He stepped up a gear or two, though, and roared back to lead 6-3 and from then on had the set under control to eventually trigger the three-end lottery. First blood went to Brett, but Bence took the second end and as champions do, Brett upped the ante on the final end to take the match and breathe a huge sigh of relief at finally getting over the line.